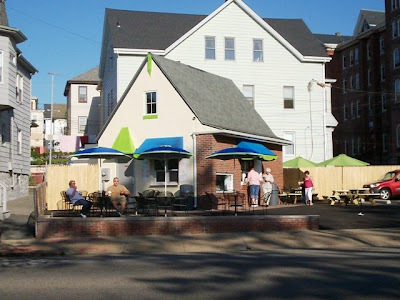 When I first noticed that the old Park Motor Sales at the corner of South Main and Park Streets was turning into a place called Gelato House, I flipped! Gelato within eyesight from our apartment sounded too good to be true. 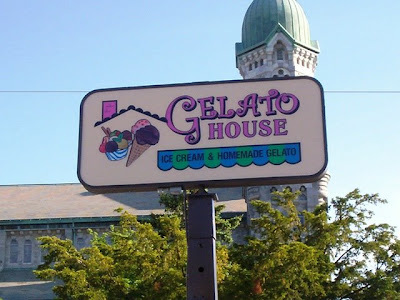 On a recent walk, I spotted a few people sitting at the various picnic tables on the property, so I knew that Gelato House had opened for business. Since we were all home celebrating Memorial Day, I figured this was a great time to try them out. I stopped by at 5:45 p.m.
Now, because it is so close to home, I was originally going to walk. However, I reconsidered because I didn't want to be responsible for dropping someone's ice cream on the walk back home. I jumped in my car and drove for about two seconds. I loved it already. There was a small crowd gathered around the ordering window so I wasn't able to get any shots of the menu board. However, I saw that they had both ice cream and gelato. A very friendly gentleman came to the window right away to take my order. At first I was going to order small cups of gelato, but the man told me that "small" was their "kiddie" size. Being a pig, I was afraid that it wouldn't be enough, so I ordered regulars all around ($3.10 each). I chose a chocolate for Dad, a coffee for Mom, and a pistachio for me (my sister didn't want any). My total came to $10.04. While I was waiting, I saw several people standing around with large drink cups, which I assumed were milkshakes. I also noticed a board with the words cacoila and chourico, so I assume they also serve sandwiches or dinner plates at Gelato House. When my order was ready, I questioned the man as to what the little dark bits in the coffee ice cream was (I thought they were coffee beans). To my surprise, what I thought was the coffee cup was actually the chocolate. What shocked me even more was that the actual coffee ice cream was white. Oh well, I've had mint ice cream that was white on occasions. Perhaps this was the same deal. The gentleman offered me a box to put my ice cream cups in. As I drove home with the box, I realized that it probably would have been faster to walk. Oh well, now I know. 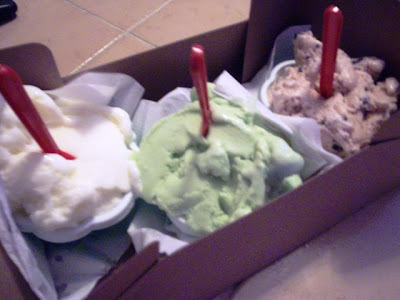 When I got home, I frantically raced around the house trying to sop up the gelato that had melted out of the tiny cups. Thankfully it wasn't that messy. Mom gave my sister a few spoonfuls of her gelato to try as Dad and I took our own cups and dug in. Hmm ... I really don't know what to say. At first Mom had asked me what flavor I ordered for her. Dad said the same thing. The reason why they were asking this question was because the gelato had very little flavor. When we have had gelato in the past, it usually tasted exactly like the flavor that it was supposed to be. Mom, being a coffee expert, said that if she were blindfolded and fed this gelato, she absolutely wouldn't be able to tell what flavor it was. She actually thought that she had a cup of base without the flavoring! Because of the stark white color, Mallory thought that Mom's gelato might have been vanilla, but it didn't even taste like that. It didn't taste like anything! We were very surprised and disappointed. Dad also said that the flavor was very faint, and if he were to put a guess to his cup, he would have guessed coffee with a few chocolate pieces. When informed it was plain chocolate, he was surprised. My pistachio did actually taste like pistachio, but it had a very light flavor. The gelato wasn't necessarily bad, it just didn't give us the wow factor that we were looking for. It also wasn't as creamy as we remembered from our last gelato experience. The texture was much icier. Would we give this the New England Bites seal of approval? Sure. We love to see new businesses come into the area, and we hope that they are here for many years to come. It is still very new (their phone number isn't even registered with directory assistance yet) and they have the whole summer to work out any little kinks they may have. Plus, it is in the perfect location for all the Kennedy Park walkers and baseball players that are going to need some cooling down after basking in the summer sun. We will be trying them again, and hope that next time will be a better experience. We will keep you posted!